On low speed add 2-4 Tablespoons a/p or bread flour until dough forms a soft mass. Shape dough into a loaf and place in a greased 8 1/2 x 4 1/2 x 2 3/4-inch loaf pan. Cover with a towel and let rise in a warm spot until it’s 1 1/2 inches taller than the pan, about 35 minutes. Note: This loaf is not as sturdy as the similar whole wheat loaf. If it's too flimsy you can make it using half whole wheat flour and half sprouted flour. For more on Sprouted Wheat Flour in my blog click here. 36 Comments on "Quick & Easy Sprouted Wheat Bread"
Made this sprouted wheat loaf today. I love that I can make it in the afternoon and that I have a fresh loaf in time for dinner. I did use a few substitutes. Light olive oil, Swerve sweetener for baking and nonfat milk. It came out great! Love your videos, such fun. Great recipe! Beautiful loaf with a nice soft texture. Just began baking with sprouted wheat flour for the nutrition benefits and greatly appreciate such a easy recipe. It rose beautifully and was great for sandwiches and toast. I read many recipes and so happy I went with yours. Jenny, you are a true treasure. I live alone and do most of the cooking. only when I need food. Your recipes are clearly written and I am successful when I use them. You add enough humor to make it memorable. Bread has become not only delicious, but funny. I have made your regular whole wheat bread recipe as a loaf and as rolls and both came out perfectly. The first bread I have EVER had come out well. I made this recipe, and it,too, was a success! Thank you, Jenny, for taking away my fear of bread making. These are the world’s best recipes! 2) I used raw sugar. 3) Since I don’t have instant yeast, I mixed the sugar and yeast into the warm milk until it got foamy, then proceeded with the directions as given. My bread has a really good texture, holds together just fine, and tastes devine. I love the moistness and sweetness of the sprouted wheat. Thank you for sharing this recipe. Has anyone tried to make this without sugar? Can I just skip it altogether to make it a sugar free bread? Hi Marci,hope you read my comment. :I made this recipe for the first time the other day and used my Kitchen Aid mixer and the dough hook.And kneaded till it didn’t stick much,added about 3 to 4 tablespoons of flour..Put a bit of flour on your counter and grab the oil bottle and get your palms wet with oil and theres no problem. Comes right off the dough hook then and easy to get out of pan. i purchased the sprouted flour the other day.Sure glad I did.Just shape it into the loaf,it’s so easy. I am an experienced baker and love nothing more then to be in the kitchen baking. Hope this helps,and thankyou Jenny. Love your recipes. I made this using weight. It was really soft almost cake like. I added about 120g bread flour and 60g sprouted flour. It’s in the oven. I’m going to bake again using volume. I made it again with a few variations: I used about 60 sprouted wheat flour, almond milk and 10g bread flour. Amazing! I was out of sprouted wheat flour and the grocery store was too. However, they had sprouted spelt flour. I’ve used regular spelt flour before and thought I would try the sprouted variety. I am so glad I did because the bread was not only beautifully brown inside (since the flour was whiter than whole wheat, I thought the bread would turn out white) but so tender and moist with a touch of sweetness without much sugar in the recipe. 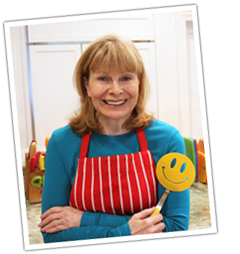 Thank you Jenny for coming up with such fantastic and healthier recipes that I feel good about eating. I am always excited when I find a new one in my Inbox. I forgot to mention that I used my Kitchenaid mixer for the entire mixing and kneading process, although I could have used the upper body exercise if I had done the kneading myself. Thanks for taking time so share this. I wish you’d leave for videos I really loved all your videos ! young, and have learned so much from you, you are a special lady…Thank you. Jenny, I am Czech and would love to see a video of you making Kolaces, preferably Poppy Seed, or Cottage Cheese. or both. Love you from back with your TV show. Always fun and you add that to the kitchen and recipes too. Would love to see more Polish and Ukrainian recipes. And a few Irish ones would be awesome too. LOL Also love the videos too! Thanks for doing this site! 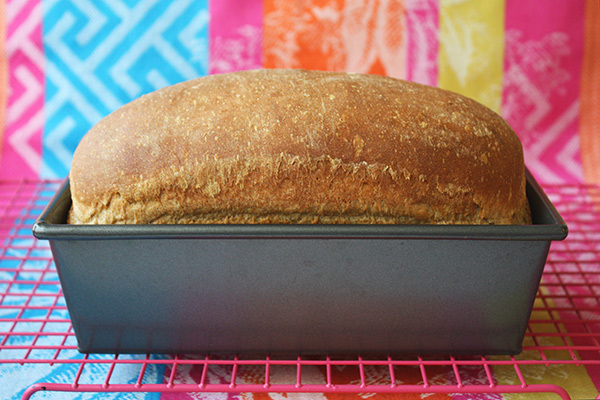 I love making bread and want to try this recipe! I always brush my loaves with a little melted butter right out of the oven as this helps the crust stay soft. I noticed the amount of sugar was cut in half for the the sprouted wheat flour version. Why the change? The process of the grain sprouting converts some of the starch and fat to simple sugars and protein. Overall, even though lower in carbohydrates than whole wheat the sprouted wheat tastes sweeter. That is so funny to see this bread recipe today, I just made two loaves yesterday!! Made it with just regularly whole wheat flour and the bread is delicious! I will be making this a lot. Also I didn’t have milk so I used one cup of warm water and a quarter cup of dry instant powder milk and it turned out great! I love your recipes, easy and delicious. I was wondering what I can substitute for the egg and milk. That looks so good I can almost smell it!!! Hope you weren’t affected by any of the disasters that hit CA!! I made few times this bread, white or wheat ,always came out perfect. I will try this one, wonder what is sprouted ? I always fallow the recipe exactly like it says. I wish folks would leave a comment after they have tried the recipe. Most of us who have been cooking and baking for a few years can read a recipe and see if it is good. However, having someone provide a comment after actually using the recipe is more helpful. Totally agree. I don’t like reading comments that just say the recipe sounds good without actually trying it. I think the comment is not meant for you. It’s meant to be a compliment to Jenny. Surely you would be fine with that. Of course and it is nice to see that people want to try a recipe whenever Jenny posts a new one. Yes, Carol. I enjoy seeing people’s immediate reaction to a new recipe, saying it looks good or they would try it. With all the effort I put in to take the picture and post a new recipe, how sad it would be if no one responded. Haven’t tried it yet but if it’s like your other breads I know it will be delicious. I mixed in KA for five minutes. Turned out great. I am sure I will love this recipe as much as all the others. I can’t wait to make this bread, looks delicious. I am in the middle of making your no knead crusty rolls for the third time and this popped up. Thanks Jenny for all your wonderful shares.